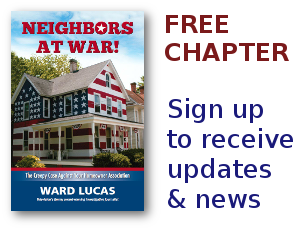 Humor Archives - Neighbors at War! No Comments on My New Book! I have a new book coming out! Exciting for me because it has absolutely NOTHING to do with Homeowners Associations! I’m lazy, and haven’t gotten it up on Amazon yet. But this Memorial Day weekend seems to be an appropriate time to announce it to the good folks on this blog. As many of you know, I come from a longtime military family. I was blessed to have the most wonderful parents and the most fantastic upbringing in the world. This book is all about growing up in a truly wacky family of Army Brats. You’ll laugh. You’ll cry. You’ll be inspired. It’s called Get This Mother Published! There are other things that make a neighborhood much uglier. Fascism. Bullying. Property values that never rise because Americans are waking up and paying attention to warnings about life in an HOA. No Comments on Absolutely Hilarious! I have no idea if what’s linked below is the real deal. It’s posted by the Smithsonian Magazine which tends to give it some credibility. I’d feel more comfortable if this had been posted on an April Fools Day. But it’s a hilarious look at what life might have been like in a Homeowners Association in Britain in 1365. Now, if we could just get Tim Hawkins to write a series of HOA songs! No Comments on I Nearly Died Laughing!!! Oh, my sides still hurt from the hilarity. Linked below you’ll see a very short and amazingly insightful video from an HOA critic who is, as yet, unknown. If I can learn his identity I intend to send that person an autographed copy of my book to show my appreciation. This fellow obviously lives in an HOA, obviously has been hassled over his holiday decorations, and obviously keeps up with current news events. And if one of you can figure out who this fellow is, I’ll also send you a book autographed to whoever you want, a neighbor, a Congressman, an HOA board member.